If you’re looking for me between the hours of 7 to 10pm tonight (April 1st), or from 11am to 10pm on the 2nd through 5th, head down to the Turia riverbed. I’ll likely be standing on a bench in the middle of the wine festival, favorite bottle in hand, slurring a rambling speech on Death & the Cosmos in my awful, broken Spanish. That’s right — it’s time for Proava’s annual Traditional Valencian Wine & Ailments Festival, which was one of our favorite events of 2008. This is the 21st edition of the festival, and will unite 113 companies offering wine, sausages, cheeses, liquors, and more. More than 200,000 visitors are expected to show up during the festival’s run. 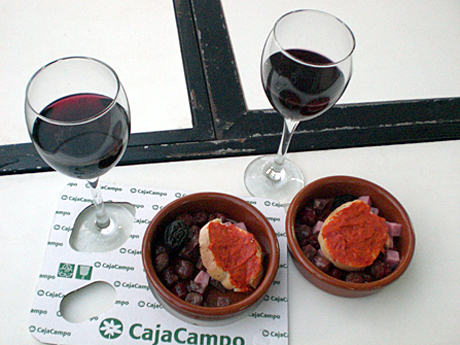 If it’s the same as last year, a €10 entrance will allow you to sample 5 glasses of wine and 5 tapas. It’s as much fun to wander around, deciding on whom to bestow one of your precious tickets, as it is to actually consume the goods. If you’re lucky enough to be in Valencia between the 1st and 5th of April, this is an absolutely must-go event. And if, towards the end of the night, you spot me lying beneath a bench, give me a little kiss on the forehead and cover me with a newspaper.